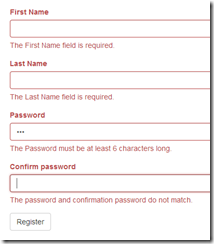 ASP.NET MVC has great built-in support for client and server side validation. 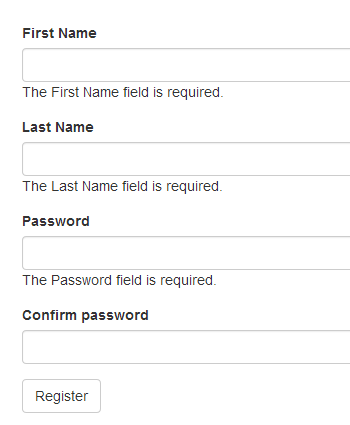 On the client side it uses jQuery Validation plugin with a custom client side library which parses the form’s elements and automatically creates validation rules from their attributes. Here’s a great tutorial that goes into details on Unobtrusive Validation with ASP.NET MVC and Razor. The validation works great with the built in templates used by Visual Studio, but as soon as you want to change the UI things start to get messy. More specifically, if you are using Twitter Bootstrap and want to follow their Validation States guidelines then you need a custom solution that integrates with the current unobtrusive validation. I have found that the current documentation for both the jQuery Validation and the Unobstrusive Validation are quite lacking, so I embraced in a source code reading crusade to try to understand it in more details. Running this and clicking Register results in the following styleless page. Notice on Figure 1, the label, textbox, and message are all black. 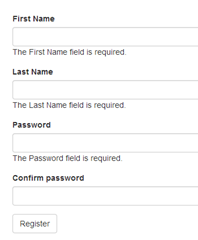 If we view source (Figure 2) then we notice that the input element was added the class input-validation-error and the error message span was added the field-validation-error class. At this point we have two options: we either create those CSS classes or simply follow the Bootstrap guidelines, which will give us a better user experience. The first option is the easiest one and we don’t need a tutorial for that, but the second one is a little more complex and, in my opinion, the right approach. To do so, we need to accomplish changing the classes of the span error messages to help-block, add the class has-error to the parent div when it is invalid, and remove the has-error class when it becomes valid. Figure 3 shows what the end result of the HTML should be. In order to accomplish all these tasks, we need to get ahold of the original validate object and change the settings by modifying the errorClass and the errorPlacement and success events (functions). Firstly thank you for the amazing article has helped my quite a lot. Have you however found a solution to making the validation work with more than form on the page or have you found an alternate solution to this? Any response would be greatly appreciated. 1. Line 15: inputElement -> $(inputElement). Also, Bootstrap provides a "has-success" class, so you can add it in line 21 and remove it in line 15 if you want. 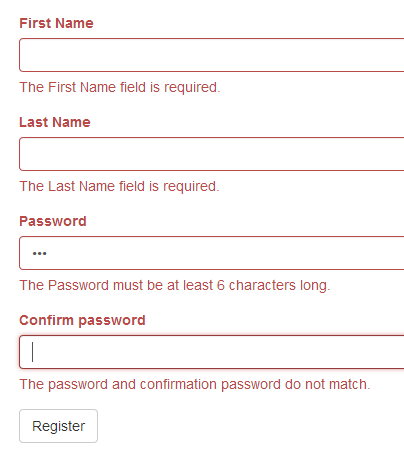 It looks like this doesn't work with bootstrap checkboxes and radios as they are wrapped in additional div.